The meeting was started off by the SCOSIT chairman Kirui Kennedy. 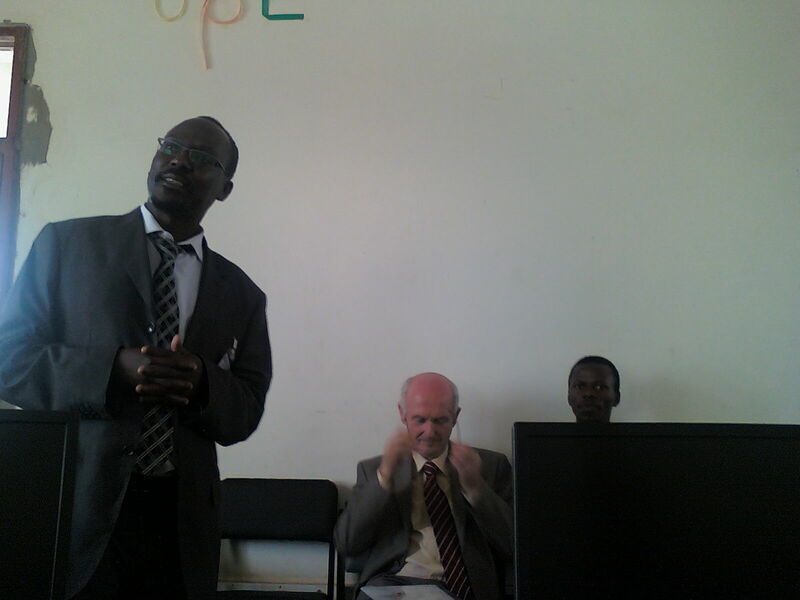 He introduced the SCOSIT patron Dr. Wafula who is also the ICT director. The meeting this time was held in the afternoon as opposed to the usual evening meeting. This is due to the fact that we had an important guest addressing the SCOSIT members. Straight away Kirui invited Dr. Wafula to the floor. Dr. Wafula introduced Mr. Kiula the head of Research, Training and Consultancy section in the ICT directorate. Mr. Kiula was one of the founders of SCOSIT and so it was a great honor for him to have graced our meeting. Next he introduced our main guest Dr. Pat Frain. Dr. Pat Frain is the director NovaUCD. NovaUCD, the Innovation and Technology Transfer Center, is the hub of innovation and knowledge transfer activities at University College Dublin in Ireland. NovaUCD’s vision is to become an international leader in the commercialization of research and other knowledge-intensive activity for the benefit of the economy and society. HeyStaks Technologies – has developed a revolutionary social web search tool which enables searchers to better organize and easily share the resources they find online. There are many other spin-outs from NovaUCD, learn more by following this link. Dr. Pat then informed the students that the best way to sell an idea to the government was by showing how it would contribute to the economy. It can contribute to the economy by employing people or enabling people to make a living out of it in another way apart from direct employment. Dr. Wafula then pointed out that the university (JKUAT) has been trying to work more with the industry in order to give more exposure to the students. It is also trying to set up an innovation center just like NovaUCD. How far has the university gone with its plan to create an innovation center? What then do we do with the ideas we have right now before the academy is up and running? Dr. Wafula: Plans for the innovation center were at an advanced stage. In the mean time there is an Intellectual Property office under RPE. Students with ideas they feel should be registered can go there or see him so that he can direct them. How is NovaUCD aiding the university towards the realization of an innovation center here in JKUAT? Dr. Pat Frain: NovaUCD has been helping JKUAT to sell the idea of an innovation center to potential partners. They have also been sharing their experience with JKUAT and will continue to support JKUAT in any way to facilitate the realization of an innovation center right here in JKUAT. How will the innovation center help the economy and especially people in the rural areas? Dr. Pat: avail jobs by spin-outs (successfully incubated ideas) employing people, seed cash to fund innovative ideas thus increasing the chances of ideas becoming successful spin-outs, generating links with industry players and students thus encouraging more spin-ins (industry players partnering with center to develop ideas). Mr. Kiula: With the spread of the fiber optic cable and the initiative by the government towards realization of digital villages focus now shifts to more localized content. We should start developing now and then devolve later. JKUAT Endeavour has proven that when you build capacity by training people in relevant technologies they will start implementing their ideas as opposed to just sitting on them. The innovation center will seek to aid more people implement their ideas and convert them to actually businesses. Dr. Pat: That can’t really be done because there are so many differences between the two. There is a song “We nearly there” and that portrays the differences. However University College Dublin and JKUAT have one thing in common: the same idea. JKUAT has been known to churn out ICT graduates but now is the time to start churning out ICT companies. That marked the end of the session. Kirui thanked Dr. Pat Frain for making time to come and address the members. He also thanked Dr. Wafula for organizing such a forum and the members for making it to the meeting. « Agriculture and ICT: Is there a relationship?